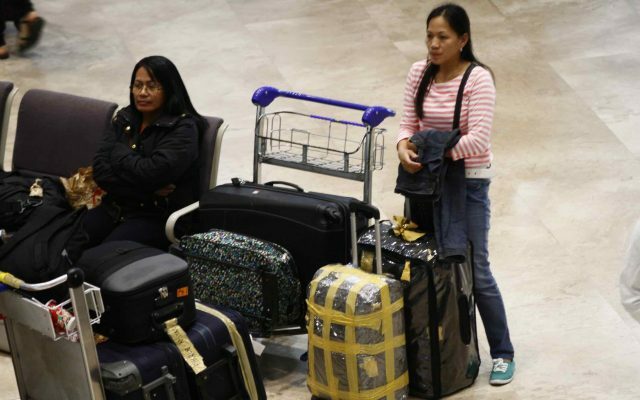 File photo of Overseas Filipino Workers at the Ninoy Aquino International Airport. Photo by Bernard Testa, InterAksyon. MANILA, Philippines — The government is looking to expand the deployment ban on overseas Filipino workers, particularly household service workers, to other Middle East nations unless these countries can assure the protection of the workers’ rights and welfare. “For example, in Saudi, it is a common malpractice that the employer trades or switches their worker to other employers. That’s what they call the kafala system and it is always for consideration,” Labor Secretary Silvestre Bello III said. “We will impose the same restrictions (as in Kuwait) and will consider deployment ban if strengthened protection of our OFWs is not assured,” he added. He said the government is pushing for the inclusion of a ban on kafala in an agreement being negotiated with Kuwait. Under the kafala or sponsorship system, the employer has the entire control over the mobility of the migrant worker. “An OFW, for instance, cannot quit work or transfer jobs without first obtaining the consent of his employer, which practically places the OFW at the mercy of his employer,” Bello explained. A team headed by Labor Undersecretary Ciriaco Lagunzad is currently in the Middle East to further assess the condition of Filipino workers and provide immediate response and assistance to their needs, as well as to recommend actions to deal with their situation. Bello said the report of the team will be the basis for the amendment or enhancement of existing bilateral labor agreements with Arab countries to further protect OFWs. “If there is an existing bilateral labor agreement but there are still rampant cases of maltreatment, then maybe we need to amend the agreement. The minimum demand of our President is that we will only deploy in countries where our workers are properly and effectively protected,” he said. Meanwhile, Bello said that the deployment ban to Kuwait would continue despite the arrest of the suspects in the murder of Joana Demafelis, whose body was found in a freezer last month, some two years after she had gone missing.